I love many of the features and this car has been reliable after 100K miles. However, I would not buy another one because of it's driving performance and it's heavy weight. 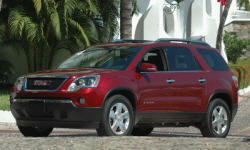 Why the 2008 GMC Acadia? Car still looks like an SUV. Looks sporty. Has been copied by many car companies. Car has so many features that are really useful. In our climate the heated seats, remote start, automatic cargo door lift, 3 climate zones, ABS, and traction control are really nice the have. If there is snow ont the ground we take this car to work. Two middle row captains chairs are great. Third row seats work well for smaller adults. Lots of good stafety features. Why Not the 2008 GMC Acadia? The vehicle has power and so far is very reliable. However, the transmission shifting seems to be tuned to improve gas mileage. That makes this vehicle very un-responsive when you want it to be responsive. When entering a freeway, when passing cars, or when driving agressively. Instead of shifting smoothly, you have to press the gas more and then it downshifts two or three gears, wasting more gas than is necessary. They screwed up on the tuning of this car. Right front pillar causes a large blind spot when rolling into a stop sign, if a car is coming from the right. Otherwise, there is a good view of the road in all directions. On ice or snow, there are good safety features like ABS and traction control. However the vehicle is too HEAVY and it's weight makes this car more difficult to stop than a compact car without ABS or traction control. IF you are an aggressive driver, this snow/ice performance will frustrate you and you will slide into intersections. Have taken this car on long trips, 14 hours of driving, multiple days in a row. The front seats are ok but not very comfortable. It's even tiring for the passenger.